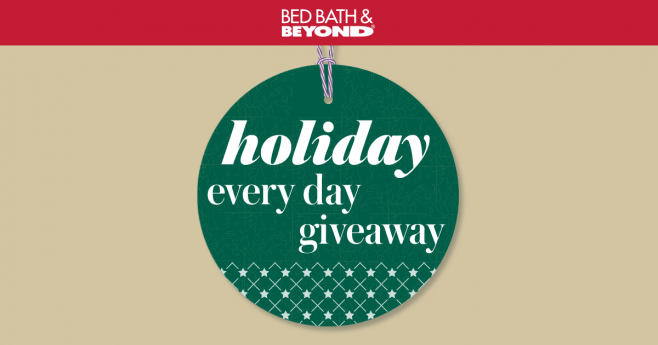 Bed Bath and Beyond Sweepstakes: Enter At HolidayEveryDayGiveaway.com! The countdown to the holidays as begun! Bed Bath & Beyond recently announced the Holiday EveryDay Giveaway, a new Bed Bath and Beyond Sweepstakes where you could win a different prize every for 50 days. A new winner each day! And all you have to do is to play at HolidayEveryDayGiveaway.com. Plus, the perfect holiday could be yours! One lucky grand prize winner will win a 7-day, 6-night Luxury Included Family Vacation for 4 at any Beaches Resort in Jamaica or Turks & Caicos and a $1,000 Bed Bath & Beyond Gift Card. During the Promotion Period, visit holidayeverydaygiveaway.com (U.S.) or holidayeverydaygiveaway.ca (Canada). Follow the instructions to complete and submit the registration form including a valid home address. You automatically will receive one entry into the Sweepstakes and advance to the Instant Win Game page and receive 1 Instant Win Game play for that day. Once on the Instant Win Game page, follow the links and instructions to play the Instant Win Game. The Instant Win Game results will be instantly displayed. Potential winners of the Instant Win Game will be provided directions for validation. To enter the Sweepstakes by mail without going online, or connecting to any of the noted social media channels to earn bonus entries as outlined above, hand print your name, address, day and evening phone numbers, email address (no P.O. Boxes), and date of birth on a 3″ x 5″ piece of paper and mail it in an envelope with proper postage to “Holiday Every Day Giveaway,” c/o HelloWorld, Inc., PO Box 5222, Department 828012, Kalamazoo, MI 49003-5222. There are 3 ways to earn bonus Sweepstakes entries available with online entry. Each entrant may click on the button to visit the Bed Bath & Beyond Social Gallery and each will receive 1 additional Sweepstakes entry. Each entrant may click on the Twitter Follow button to “FOLLOW” Bed Bath & Beyond on Twitter and each will receive 1 additional Sweepstakes entry. Each entrant may click on the Instagram Follow button to “FOLLOW” Bed Bath & Beyond on Instagram and each will receive 1 additional Sweepstakes entry. Each entrant can earn a total of 3 bonus Sweepstakes entries during the Promotion Period through the methods described above. 11/4/2016: Three Lenox Holiday 12-Piece Dinnerware Sets. Each set includes four 3 pc. place settings with 10.5″ dinner plate, 8″ salad plate and 12 oz. mug. 11/13/2016: Epicurious Aluminum Nonstick 11-Piece Cookware Set in Copper and Epicurious Holiday Handbook. 12/14/2016: Set of four ED Ellen DeGeneres crafted by Royal Doulton Mugs (Joy, Love, Kindness and Smile) and Choice of ED Ellen DeGeneres Holiday Pillow & Throw. 12/16/2016: Seiko Coutura Men’s Perpetual Solar Alarm Chronograph Watch in Two-Tone Stainless Steel with a Warm Gray Dial. Sapphire Crystal and Water Resistant to 100M. Six nights’ Luxury Included accommodations at winner’s choice of one of the following Beaches resorts: Beaches Turks & Caicos Resort Villages & Spa- Providenciales, Turks & Caicos OR Beaches Negril Resort & Spa- Negril, Jamaica OR Beaches Ocho Rios – A Spa, Golf & Waterpark Resort- Ocho Rios, Jamaica. Prize includes all meals, unlimited premium brand beverages, daily & nightly entertainment, all land and water sports, including scuba diving (for certified divers), snorkeling, Wi-Fi in all rooms and public areas, access to the Xbox Play Lounge and Kids Camps, gratuities, and transfers to and from the resort designated airport. Approximate Retail Value of the grand prize is $11,000 USD. Bed Bath & Beyond Holiday Every Day Giveaway is open only to legal residents of the 50 United States, the District of Columbia), Puerto Rico, and Canada (excluding Quebec) who are at least 18 years old or at least the age of majority in their place of residence at the time of entry. This Giveaway begins on November 1, 2016 at 9:00 a.m. Eastern Time and ends on December 20, 2016 at 11:59 p.m. Eastern Time. Each entrant may receive a maximum of 53 Sweepstakes entries total during the Promotion Period regardless of method of entry and each entrant may receive 1 play per day during the Promotion Period. Administrator will randomly select the potential Sweepstakes winner from all eligible entries on or around January 6, 2017. Fifty random, computer-generated winning times, 1 per day, will be generated during the Promotion Period. The total approximate retail value of all prizes is $25,256.84 USD. Sponsored by Bed Bath & Beyond Inc., 650 Liberty Avenue, Union, NJ 07083, U.S.A. Administrated by HelloWorld, Inc., 3000 Town Center, Suite 2100, Southfield, MI 48075, U.S.A.
For complete details, including Official Rules, visit www.HolidayEveryDayGiveaway.com.